Serve your chilled drinks in style with this Acopa 5 gallon beverage dispenser with glass lid. Designed to enhance your beverage presentation, this beverage dispenser has an attractive octagon shape and raised texture that adds personality and individuality to its functionality. It's perfect for any restaurant, cafe, coffee shop, or hotel that is looking for a stylish way to serve their lemonade, iced tea, fruit punch, or other refreshingly cool beverages. Hey Guys and Gals!!! First of, let me tell you about the shipping. I live in Canada and thought that I’d have to wait long but nope it was super fast! I did however pay a decent amount for shipping...it came in one piece, no broken glasses and they wrapped it very well!! I’m super happy!! Now onto the dispenser; I LOVE IT! I wanted to test it out first before reviewing and I can tell you I’m very impressed. The glass is hard/strong/thick and definitely durable! I usually don’t review stuffs I purchased online but I had to do it for this one. It is huge and I’ve used for kombucha, water kefir, filtered water and juices. It has not let me down. I love the exterior design and I’m definitely getting the stand next. I give two thumbs up to WebstaurantStore and two thumbs up to the manufacturer! I’m a happy camper, hope you enjoy it as much as I do, Cheers! this dispensor is a very beautiful container - huge capacity - very attractive pattern on the glass and lid - makes a very nice display for any beverage. This dispenser is a mainstay of our catering. Drinks have such high margins that it's awesome to be able to offer such an elegant service to the customer. We purchased this to use for our cold brew, I was hesitant to purchase such a large glass item online by it was packaged great and came in in one peice. This was also a great price and we received it quickly. The lid fits nicely and the mesh bag I purchased also fits perfectly for our cold brew. I ordered this dispenser for use at home to store distilled water. I was worried about thin glass,poor packing,breakage during shipment. I actually asked the FEDEX guy to wait while I shook the big box listening to broken glass! No problems whatsoever. Packing was perfect. No damages. The spigot comes separate as I expected. Very easy to attach it. With 2 silicon(?) washers,one in, one out, finger tightening is sufficient. There was no dripping. The glass cover fits perfectly. We put it at the edge of the counter so that we can fill 2 liter jugs easily. The streaming of water is not much. Just be patient! Overall, I believe it is a good buy. I had purchased a similar beverage server on a glass stand and was needing a replacement jug. This is just what I was looking for. It fits by wrought iron stand. Purchased this beverage dispenser to serve free water at our coffee shop. Its very stylish and works perfect for our needs. I would highly recommend this product to anyone. The product feels high quality and very sturdy. Love these huge drink dispensers! For big parties it’s perfect because you only have to fill it once. you don’t have to continue to fill them up. These 5 gallon containers are our favorite to make sure that we have the right size beverage dispenser for catering. Only downside.... they get super heavy when filled. This is beautiful! The first one that I received was cracked, and Webstraunt literally had a new one to me in two days. It holds a lot of water, which is perfect because you don’t have to constantly refilling. Love the beveled look. I ordered 2 of these but I only set up one, it’s leaking really bad and the seal doesn’t seem to be working. I like the way it looks, but I’m not sure I will be ordering anymore. Thank you for your review, simone! We are sorry this Acopa 5 Gallon Hammered Glass Beverage Dispenser started leaking for you. A Customer Solutions Representative will contact you soon! I've bought around 20 of these so far. Our customers like the look, which works well in vintage or farm style weddings. We had many shipments come in damaged, and after numerous reports of this, I believe they are now being packaged much better to prevent this. Webstaurant did replace all damage units for us without any problems, though several times it took a few tries to get it right. They are slightly fragile, and I wish the stands were a bit beefier. But we now store and transport them in plywood boxes and aren't breaking them during delivery any longer. The stands seem a bit lightweight, but so far only one has broken and we're happy with them. I just bought 6 more today, and according to the demand for them in the wedding and event industry, will keep buying them. Nice large dispenser, with a huge capacity. Two of these will provided about 100 people drinks for around an hour. Give or take a ambient temperature. This looks beautiful, but is cheaply made. I ordered one and it cracked in the dishwasher after the first use. They replaced it (thank you Webstaurant!) but the replacement also cracked after only a few uses. Very disappointed and will not be buying again. We appreciate your review, Rachel Miller. We wish this Acopa 5 Gallon Hammered Glass Beverage Dispenser would have worked out for you. Our Customer Solutions team has credited your account! This is a fantastic product. We use it all the time for catering events, and for making sure that we have water available for customers. By far the best beverage dispenser you can buy from acopa. They have always made quality products. Thank you so much, this is exactly what we were looking for. The Acopa 5 Gallon Hammered Glass Beverage Dispenser is well made and durable. It adds a little nostalgia to your establishment and is easy to clean. We purchased these because we needed an elegant looking 5 gallon beverage dispenser for weddings. The first two we ordered arrive in perfect condition with adequate packaging, the next several arrived broken. Webstaurantstore.com handled the shipping issues beautifully, however the glass both in the main unit and the lid must be handled delicately as they crack easily. I would not recommend purchasing these for off site use. Thank you for your feedback, Adam! We are sorry these arrived broken, your account has been credited! This glass dispenser is very pretty to look at. Be aware, however, that it is FRAGILE! Place it where you want to serve and fill it at that spot. If you fill and then try to lift it to move it, chances are you may drop it. It's a beautiful piece. A lovely, large capacity glass beverage dispenser that is great for parties and catering events. 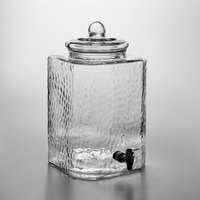 The hammered glass makes the dispenser very attractive, and it s a very thick walled glass. The perfect 5 gallon dispenser! Purchased two 5-gallon beverage dispensers for my wedding in August 2016. Went to use them again on April 2017 and both are leaking from the spout area. Brought this up to customer service and they are doing nothing. I will never purchase from here again. We appreciate your review, Jessica! A Customer Solutions Representative has setup to have 2 replacement spouts sent to you, for the defective spouts you currently have. I ordered this 5 Gal Glass Beverage Dispenser for my wedding. It looked so beautiful an elegant. I will be using this for future events. Either I have bad luck, or this is a horrible product. I purchased one on March 3, 2017 and the lid cracked (and by cracked, I mean shattered) within three weeks of purchase. I ordered a duplicate replacement on April 12, 2017. Again, it lasted less than one month before it started leaking. Considering this site caters to commercial use, I'd expect better, sturdier quality. Thanks for your review! We are sorry to hear about the trouble you have had with these dispensers. A Customer Solutions Specialist is currently assisting you. The highest quality beverage dispenser of the many we use. I particularly like the 5 gallon capacity as it requires fewer refills during dinner service. Very nice looking and work well with our large events save time filling drink stations often. Only problem is had trouble with breakage during shipping. customer service took care of the problem as always. It was not a issue with the way they were packed it was poor handleing on the way to me. They went out of the wat to kake sure they were packed well and even they can't control what happens after it leaves but made it right with me and reshipped promptly. I was originally disappointed because my Acopa 5 Gallon beverage dispensers were broken upon arrival. I contacted Webstaurant and the replacements were delivered the next day! Awesome service! These are sturdy. I use them for kombucha brewing, but I also use them for juice occasionally. The spigots are sturdy plastic and have not leaked on me yet. They look attractive too. OMG! I had been searching for the best beverage dispenser and I have found it! Perfect zip and it gorgeous with and without a beverage on the inside. No issues thus far and I'm sure it'll stay that way! I ordered this dispenser for making kombucha at home. I'm thrilled with it!. While allowing about an inch at the top for the Scoby and enough starter tea in the bottom, to the spigot level, I'm able to produce 3 gallons per week. I also ordered the stand..... Beautiful set up! I'm extremely happy! Very happy with are purchase, however the packaging and shipping is horrible. The first dispenser we received was not packaged properly and arrived in pieces. The glass dispenser is very thin glass and did not have any bubble wrap around it for protection. The second dispenser was packaged the same and the box arrived partially damaged and no bubble the dispenser was not broken luckily. Thank you for the feedback on the packaging for these dispensers. We are always looking to improve our packaging and processes. A Customer Solutions Representative was happy to help you in this matter. Loved this dispenser. Worked out perfectly for my holiday parties as well as perfect for my kids sporting events. It is easy to fill and lasts a long time before I had to refill. Excellent dispenser for brewing Kombucha. We started with a much smaller bottled, but moved to this one and have not looked back. Excellent product with great results. I bought 2 of these dispensers because I am a small batch Kombucha brewer and I love them...I have been able to bottle almost 20 gallons within the last month...they are great for my continuous fermentation process. The only thing I have a problem with is that the spigot is now clogged...they are not easy to clean out and I can't find how to buy a replacement spigot on this site...The local brew supply store spigots are too big for the glass hole on these...it would be nice to have an easy way to reorder parts assoc. w/ the product. Thanks for the review! We are happy to hear this dispenser is working so well for your kombucha! For replacement spigots, see the "Looking for Replacements?" tab in this product's page. There you will find all of the replacement parts we offer for this item, including the replacement spigot. I absolutely love these glass Beverage Dispensers! I am using them for my wedding to fill with mixed drinks and wine and they are going to be perfect! Perfect for large events. The are beautiful and excited to use at my daughters wedding in a couple of weeks. Elegant and will be useful for other occasions. This is our most popular beverage dispenser, Originally purchased this design at a local warehouse store, we purchased additional units from webstaurantstore to replace units that broke through customer use. Shipped units arrived in great condition and packed well to protect them. We're disappointed that they are currently out of stock but not surprised because they are in such demand. We have gone through quite a few being broken by customers due to the thinner glass, but I would not consider them fragile. For the price, they are a great value. While these look nice, I would definitely not recommend them For commercial use. They are very fragile, to the point that they frequently come in damaged and are very easy to damage in transport. The nozzle is mounted so far off the bottom, that you cannot even get the last 3/4 gallon of liquid out of them. I would recommend looking at alternative options. Thank you for your review, Philip! We are sorry you did not like the beverage dispenser you purchased. We appreciate that you contacted our Customer Solutions Department. We were happy to make reparations for the damages.